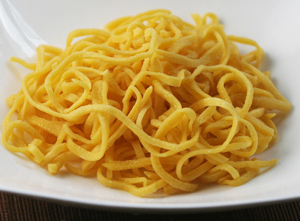 Tajarin is a pasta specialty of Piedmont, Italy that is made with 00 flour and all egg yolk giving it a golden color. In Italy recipes will be found with twenty yolks and more per kilo of flour -- some recipes state as much as 40 egg yolks per kilo. 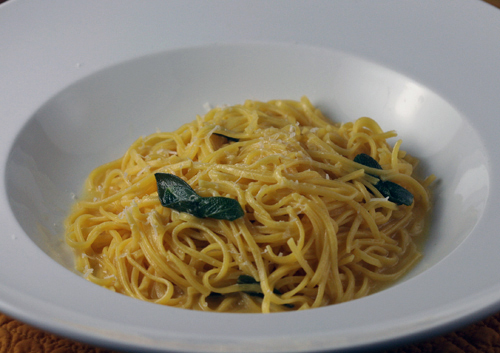 The high amount of egg yolk gives the pasta a luxurious taste and texture. Using only egg yolks also creates a brilliant golden colored pasta a result of the carotenoids in the chicken feed. When you make Tarjarin with a pasta maker you can cut it with an attachment which will give you 2 mm wide pasta. If you cut it by hand (shown left) expect to get irregular shaped widths. Egg yolk pasta cut using the 2 mm setting. 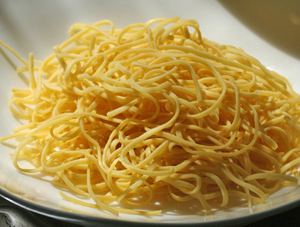 Tajarin is the Piedmonts dialect’s name for tagliarini, a thin, flat noodle. Tajarin is a flat noodle that is usually less than 1/8" wide. It is served either with a Bolognese sauce or a sage butter sauce. If white truffles or white truffle butter is available those are of course preferred. 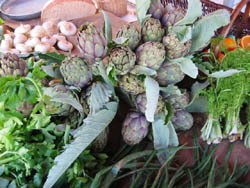 While Tajarin can be made fresh it is also available in the US in dried form from Italy. If you live in NYC, Eataly has several varieties of Tajarin dried pasta. 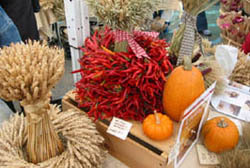 Put the flour in a large bowl or on a flat surface. Make a mound and form a hole in the center of the flour. Add the ingredients to the center of the whole. Blend the egg yolk into the flour by moving in a circular path until the flour has incorporated all the egg and a dry pasty texture is achieved. Scrape all the mixture onto a dry board. Using a dough scraper slowly start to knead the pastry. Add more flour as needed. Continue to knead for another 3 minutes, remembering to dust your board with flour when necessary. Wrap the dough in plastic wrap and set aside for 20 minutes at room temperature. Cut your ball in four equal portions and begin to roll the dough out through a pasta maker till the next to the smallest setting is achieved. Feed each sheet through a thin ( 2 mm) cutting attachment made for your pasta machine. You can also as done in Piedmont, dust the flour after rolling out with flour, roll it into a cigar cylinder and cut with a sharp knife thin ribbons about 2 mm in width. Fluff the pasta out and let dry on paper towels. Cut the dough with a large 4" cookie round. Note: If duck eggs are available use 2-3 duck egg yolks per cup of flour. Pick off a bunch of sage leaves. Melt some butter in a sauté pan and cook the leaves till bright green. If you have some white truffle butter use that before plating the dish. After the pasta is cooked toss it in the sage and butter sauce and add the grated Parmesan cheese.